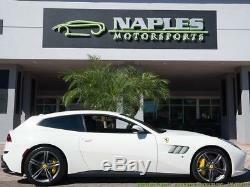 Naples Motorsports has the Largest Inventory of Exotic Cars in Southwest Florida. Carbon Fiber Steering Wheel w/ L.
Shift Lights, Active Front Lighting System, Suspension Lifter, Yellow Brake Calipers, 20 Forged Rims - Dark Painted, Horse Stitched on Headrest in White. 2019 Ferrari GTC4Lusso 2-Door Hatchback. 6.3L V12 680hp 514ft. 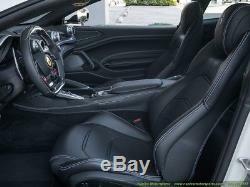 Bianco Avus Exterior Nero Leather Interior. 6.3L Hand built V12. 680 Horsepower 515 lb-ft Torque 7 Spd Dual Clutch Transmission. Shift Lights Active Front Lighting System. 20 Forged Rims - Dark Painted. Horse Stitched on Headrest in White. Bi-xenon Headlamps with Daytime Running Lights. Front and Rear Parking Sensors. Satellite Navigation System Bluetooth Audio Streaming. Naples Motorsports has a 4 bay mechanical shop. We have state of the art equipment and we guarantee the cleanest shop you will ever find. Please stop by for a personalized tour of our facilities. Keep in mind we have the ONLY Hunter Auto34 tire machine in Southwest Florida. We also have a Hunter Road Force wheel and tire Balancer as well. When you deal with Naples Motorsports you are dealing with the best in the industry. We recommend Priceline for all of your travel planning needs, name your own price on flights and hotels! We are located in the heart of Naples, Florida. We have a private airport right next to us or you can fly commercial into Ft.
We also have a relationship with a local hotel with corporate rates. Your relationship manager will of course help with your local itinerary. Naples Motorsports offers specialized finance and lease programs. We have terms from 48 months to 84 months. We also have a hybrid lease program which we provide amortization schedules to show upfront what early termination would cost. We are one of the top resellers of pre-owned Exotic cars in the country. We have very competitive terms and rates. Let your relationship manager work with you to get YOU the best deal. We will spend the time and explain the differences between different options. Contact a relationship specialist to talk about warranties. Some of our cars have the remaining factory. We also can provide extended service contracts for some of our vehicles. We look forward to earning your business. Naples Motorsports arranges transportation through our logistics department. Contact a relationship manager at 239.430.5655 for rates and timing. Let us handle the details while you sit back and relax. Once your car arrives you will be thrilled at the service that we provide. When a deposit is received , the vehicle is taken off the market and other buyers may be lost. All deposits are only refundable at the sellers discretion. This includes the completion of any finance or lease contracts necessary for Naples Motorsports Inc. Assumes no responsibility for damages incurred after the vehicle leaves our premises. Will NOT handle any arrangements for export outside the US. It is the purchasers sole responsibility to handle all related details and transport of any vehicle to be exported. In no way represents or implies as to any vehicles legal ability to be exported outside of the US. We also have corporate rates at Bella Sera right at Naples 5th Ave. Historic dining and shopping area should you need lodging and would like to take advantage of being here in Paradise! No allowance or set aside will be made on account of any incorrectness, imperfection, defect or damage. In the event a vehicle fails state emissions inspection, Naples Motorsports, Inc. VEHICLE INSPECTION: Naples Motorsports, Inc. And it's representatives have made every effort to accurately and fairly describe the vehicle to you and disclose any known information regarding the vehicle. Buyers are provided with all additional items that were provided to us with the vehicle. Buyers are to expect that NOT all used vehicles will be provided with full sets of keys, books, CD magazines, Navigation Discs, floor mats or the like, NOR will all cars be accompanied by detailed service records etc. Will not be held responsible to provide any additional items other than represented as with the car unless detailed in writing by an authorized representative. All inspections are to be performed on premises at Naples Motorsports showroom or at a local shop in Naples, FL. Please call if you need recommendations of inspection services available in Naples. Will review any issues or concerns that develop as a result of an inspection and will make repairs , adjustments or concessions at their sole discretion. 1250 Airport Pulling Road South Naples, FL 34104. The item "2019 Ferrari GTC4Lusso" is in sale since Friday, January 18, 2019. 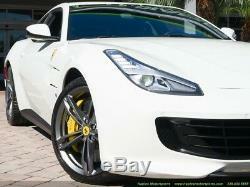 This item is in the category "eBay Motors\Cars & Trucks\Ferrari\GTC4Lusso". 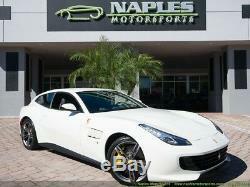 The seller is "naplesmotorsports" and is located in Naples, Florida. This item can be shipped worldwide. Engine: 6.3L V12 680hp 514ft.